GREAT REFERRALS DESERVE GREAT REWARDS! Since 1985 Childcare Manager has been the preferred software solution for Childcare Professionals everywhere. We have grown through the years and are proud to say that more than 30,000 Childcare Professionals have made us their Software of choice. And it is referrals from people like you that have helped us reach this pinnacle... …And Great Referrals Deserve Great Rewards! Refer a new childcare center to us and if they purchase Childcare Manager as a result of your referral, we will add an additional one year to your existing Extended Service Plan (ESP)*. That’s a $139.00 value! A new client is actually a “new client”. If the referred center has received information from Childcare Manager in the past they do not qualify. You must call Childcare Manager ‘yourself” with the referred centers name, address and phone number. We will send them a Free 14 Day Trail Demo packet and note you as the referral source. If the referred center calls Childcare manager directly, they must give us your name as their referral source (Make sure they have your name and center information). 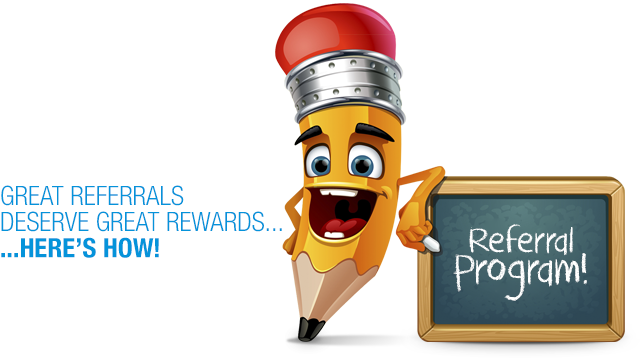 So refer your friends and colleagues to Childcare Manager and guarantee yourself Great Rewards! *In the event your ESP is expired Childcare Manager will adjust your plan based on your current expiration date.